Summer came early, you might say, with Tioga Pass opening in late May, which offered a good long time for camping trips up in Tuolumne Meadows. On one of the trips our elder, Bill Tucker, brought up five Yosemite native young people between 11 and 16 years old. The morning started early. At first light, we got the fire going. Bill would walk over to the 6-man REI tent to tell the guys to get up. It only took saying it once. It was chilly out. They all walked out to the fire, some barefoot, some just in a T-shirt, eyes half open. It’s such a magical time of day, where the idea of waking up is profound with light brushing across the trees, the birds starting to sing, squirrels running around, deer crossing the river. The morning talk is on. Having an elder to keep things in perspective was a good and powerful experience. Kenji, Les James, Bill and I had all met a year or so ago when we wrote about the native language and how to bring back the value and sacredness that comes with it, the connectedness of people. That ideacame to life in the morning. At some point in our morning talk about respecting life and how to work together, Bill would say to the youth to go to the river and make your offering to the water, the earth, your family. Then when Katie said breakfast was ready, Bill would have one of the guys say something about the food, to appreciate it. The same for dinner. Always taking a little time to honor life and what gives us life. This way of being together for our 3-night, 4-day set the stage for everything we did. I learned a lot about staying true to our pace. It’s not a race or competition. Bill kept slowing the guys down, saying “Why are your heads down and walking so fast? You’re missing everything, like that falcon’s nest.” So we stopped and had a little snack and talked, yet getting to our destination Cathedral Lake anyway with lots of time. Thinking about time, culture, language is so interesting. These are things that nature evokes. I would say it’s written in us, the rhythm of moving, breathing, staying in tune with the heartbeat. Recognizing the new day, listening to the harmony of nature, watching the sunrise – the youth resonate to these ways of flowing with natural time. Adjusting to this rhythm first thing in the morning brings me back to a kind of healthiness for our being, you might say, the “being” part of human. This profound experience was helped by our elder who sees the value and importance of showing our young people how to greet the new day, something good for everyone. Tucker has always shared this, it’s just part of who he is, and it was an honor for us all to be together. On another of our trips, Karen Rust, a teacher and counselor from Mariposa, came up again with some of her students. She offered the following reflections on the trip, which we share with you. Last winter Ron Kauk was able to come down for an assembly at the Mariposa Middle School. The 8th grade students were invited to experience the wonder of Yosemite through Ron’s stories and slides. Several of the students seemed magnetized by Ron’s presentation and came up to talk with him afterward. Ron had said to me that he was open to the idea of building relationships with a small number of local youth over time to see what would happen in its natural flow. These initial conversations led to these students participating in three separate outings in Yosemite during the late Spring, Summer, and Fall. Nearly a year has gone by, and these young people have come to know each other and their Yosemite backyard in new and exciting ways. A group of five students has been able to spend one day in Yosemite last spring, four days in Tuolumne over the summer, and our last outing in late September on the Merced River. It was obvious to me on the YARTS bus on the way home from our last day together, that they had thoroughly enjoyed themselves, each other and their place. We had spent the better part of the day, wandering back and forth across the Merced, only covering about a quarter of a mile stretch of river. How many hundreds of times have I driven by this spot, and not even given it a glance? During the day we ate lunch at the most exquisite granite table, imagining ancient groups like ours sharing food preparation, stories, splashing in the crystal clear water, (even in September in a drought year), eating together, balancing on log crossings, making driftwood art, and seeing a bear in the rocky crevices of the far shore. Ron Kauk has opened up an opportunity for us to immerse ourselves in the present and delight in it. How can we be totally alive to our senses when we are hurried and worried to death and dullness? In these little oases of outdoor living, we have been present with each other and our setting. The four day stay in Tuolumne was a true highlight of the summer for all of us. The meals were simple, healthy, and the organic produce and oh so fresh. As a veteran backpacker and camper for 30 plus years, I am not accustomed to fresh produce at the campsite. The students were able to help prepare the meals and in one case, the understanding of how to prepare and include vegetables in cooking was life-changing for her. She said, “You know how we had the chicken meal on our last night and we used Grandma’s recipe plus the veggies; now we add veggies whenever we make it.” Our meal planner and Chef Katie added a key ingredient for healthy, balanced life together. As a social worker/school counselor, I am increasingly aware of growing numbers of students that experience anxiety and depression. With the pressure in school to achieve standards, and the financial pressure on the families, it becomes all the more important to maintain a balance of self-care and family play. Five fourteen year-olds found themselves playing, creating, interacting, and challenging themselves physically beyond their expectations of themselves. One of the girls stretched herself physically when bouldering and learned, “Even if you doubt that you can do something, try it anyway. If you tell yourself you can’t do something, make it your mission to prove yourself wrong.” One of the guys challenged his negative self-perception, “Never doubt yourself and enjoy the moment, even if you think you are insignificant, keep an open mind and you will learn that you are more.” Thanks to the unique opportunity that these students have had with Sacred Rok, they have more vitality and motivation to explore beyond their borders. Isn’t that what education is all about? We really want to thank Karen for collaborating with us at Sacred Rok. Her experience in backpacking and being in the Sierras have put her in a perfect position to bring the kids from Mariposa up here into Yosemite. These young people are now creating their own slideshow, which will help us learn more about developing long-term relationships and reflecting on our shared experiences. The potential is unlimited to follow education nature’s way. We thank all of you for your support and donations. These two trips we shared with you continue to inspire us to continue our original mission – to respect nature and through that to respect ourselves. Staying true to our on-going relationships, two groups of four Boys and Girls Club youth returned to continue enjoying the adventure of being in Yosemite. One group which came first in March for the snow storm decided to wait until the snow melted before braving the elements, and they got to play in Tenaya Creek under Half Dome. The other group that first came in February enjoyed a day under El Capitan at the river on a sandy beach. For both groups, even after just their second trip, it confirms for me the importance of continued relationships that connect us. We learn from each other every time we get together. The probation guys also returned twice. 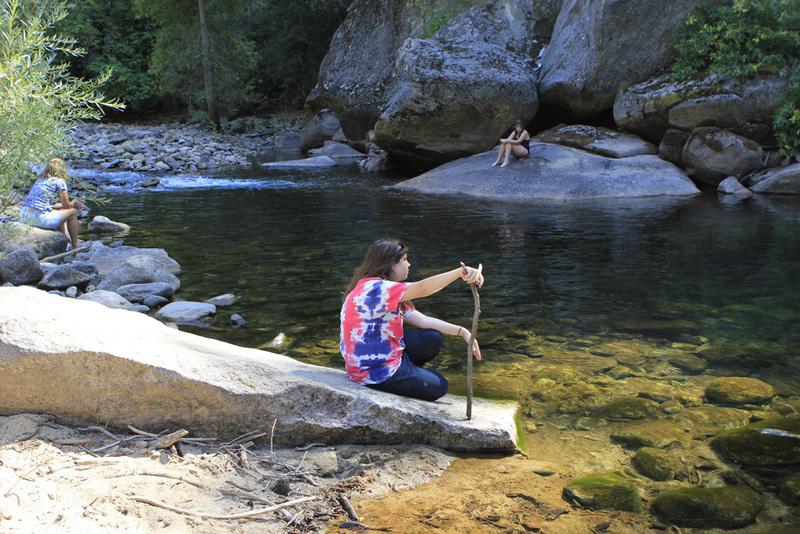 Their first trip was spent observing the river along the Lower Merced Canyon. From there, we went to the top from the backside of a 1,000 foot cliff to consider the perspective of looking back down on the river. Interestingly enough, we ran across the Yosemite Search and Rescue team taking time to practice their rescue techniques, including Jesse McGahey the climbing ranger. Jesse has been part of our collaboration. He has helped Sacred Rok to join in with the Park Service and the Yosemite Conservancy on some trail work to fix some of the approaches up to popular climbs where erosion has become a problem due to years of a lack of care-taking. So the following trip found us working in the Cascade Falls area – we put in a few good hours reshaping the trail building steps with rock work so that it would better endure the traffic – the guys worked hard. It was a great exercise in working together, and that felt good. To top it off, we celebrated by then going down by the river to have a picnic that Katie prepared. We were also fortunate to have a Mariposa middle school group of five come up. This came about after being invited to give a presentation back in February where I showed “Return to Balance” and shared stories of my life spent climbing and its symbolic lessons. Their teacher Karen and I talked about arranging a trip to Yosemite in May or June. I didn’t hear from her for a long time and was wondering what might have happened. After months she emailed me saying she was sorry to say the middle school would be closing due to budget cuts and they wouldn’t be able to do the trip. I called her and told her that it wasn’t necessary that the school be involved in getting the youth up here and that we would be happy to fund the trip. She was so happy and thanked us for staying positive. It made me feel good that we at Sacred Rok could say yes. I must thank everyone for the help you have given Sacred Rok and it’s against-all-odds approach where we feel it’s time to remember what it means to be human and work together for the future of all life. When we say Education Nature’s Way, we really mean it — bringing the young people to one of the most beautiful places on Earth is about inspiration, education, healing and the search for the wisdom of nature and our place as human beings. Nothing lives without water. Yosemite in spring and throughout the year is a display of the beauty and Sacred reality of water. We feel that ongoing relationships with our young people will help us all to develop together, making better sense of the reality of Nature and to become truly educated into responsible, compassionate, caring human beings! From our experiences it’s interesting to imagine where these ongoing relationships will lead us as we creatively engage in conversations and generate possibilities such as connecting youth to work in the park. I feel that at Sacred Rok, one of our strengths is to grow organically, and so we appreciate hearing from you about what you think, and how you might participate. Note: The trips with the Boys and Girls Club are funded by a grant from The North Face Explorer Fund and United Way of Merced County. The probation trips are funded through a flexible grant from Clif Bar. The Mariposa middle school trip was funded by your generosity. Thanks for the support! Spring has arrived and with it Sacred Rok is excited to be starting off another year of continued relationships with young people in Yosemite. The start of the year found me at the Emeryville headquarters of Clif Bar, participating in their weekly company meeting as the invited guest of their founder, Gary Erickson. Gary and I share a friendship that goes back many years, and interestingly enough, we were born on the same year and day. We are connected in our appreciation for the Sierras and nature in general. While I went about my life as a climber, Gary has shaped his company on sustainability and respect for nature, so in a way, it was natural for him to be excited about Sacred Rok, and he invited me down to the company to talk about our mission, and to celebrate our collaboration on the new packaging for the Builder Bar, in which he used an image of me. My visit to Clif Bar showed a good example of what the world of business can be when there is respect for the natural environment, which provided for the business in the first place. The company environment is amazingly happy, a dog-friendly, open space created from natural and recycled materials with exercise and relaxation areas, a child care center, and a great kitchen. Being there I saw what they mean about building a business and brand through their values of commitment to the planet, the community, and their people. Gary has inspired me to consider what is possible with a good collaboration of people who have diverse talents. I got to continue my conversation with Gary as we drove together north of the Bay Area to St. Helena – Velo Vino – which he and his wife Kit Crawford started. There in the company of a nice gathering, Gary and I did a presentation about our shared adventures and I got to talk about my life as a climber and, again, about Sacred Rok. It was an exciting evening to feel the response and support of many people who could relate to our story. After these two events, Gary and I were talking and we agreed that our theme of the past few days was “What does it mean to be human?” What is the true meaning of education? That’s our commitment, to understand the true meaning of education. Everybody agrees we have to have a good education, but our definition of education needs to be challenged — otherwise why are we polluting the air and water and blowing each other up? Thanks to support from Clif Bar and our other partners including United Way of Merced and North Face Explorer Fund and many individual donors, we have continued to have a steady stream of trips, working with the Boys and Girls Club of Merced and the probation department. In one of the recent trips, four young people came up for the day on the YARTS bus, and Katie and I took them to Cascade Falls for lunch, where one of the boys announced that he could spend all day right there. Just “being” in Yosemite can be as simple as learning to relax and be inspired by the nature and the beauty, stimulating the senses and remembering how to be human. After Cascade, we stopped at Fern Spring where we looked at the water coming up through the ground and filled up our bottles. How interesting it is to observe how naturally the young people are drawn to the water… I stood marveling at how profoundly powerful the expression of this spring is when we stop to acknowledge the reality of it — this water has been held under the earth and surfaces at the entrance to Yosemite Valley. We stop here not just for the water but to reference the sacred nature of the place. In acknowledging this spring it helps to orient our group to why we are here and what we are doing. From this point it helps harmonize and synchronize ourselves to the surroundings – the river, the trees, the rocks, the breeze, the birds — all of this is the curriculum, the greatest teacher is nature, and my job is to be the facilitator. When the young people reach down to the water and put it on their own face, a connection is being made. And when we recognize the value of water we come to respect and acknowledge it as our life source. One of the probation youth on another trip up the Yosemite Falls trail – possible in this dry winter — wanted to know how far the trails go, and when I told him that these trails go for hundreds of miles in different directions, he said, “I just wanna keep going.” The way he said that was a really strong expression of his sincerity and the inspiration that he was getting as we went up the trail , and the way that he said it made me feel that we are on the right track. As I was preparing to climb up the cliff the other day, I noticed the moon rising over the mountain to the east, but I was still feeling the sun setting in the west. After climbing about 200 feet, I came to a foot-wide ledge, where I turned to face the canyon. I’ve been coming to this cliff – the Cookie – at the entrance of Yosemite since age 15. I know this place well, and call it my sacred space. This moment was powerful. I felt as though I stood suspended between the moon and the sun on this one-foot ledge on earth, overlooking the flowing river with its own history. This moment signaled to me what I mean by learning, and summarized what the great teacher – the earth – has taught me over time by the feeling of the wind and the sound of the river – it’s all based on learning to develop relationships through appreciation. I guess not every climber would think these thoughts at the Cookie. Later on at the base of the climb, I mentioned my experience of being between the sun and the moon to two climbers, who appreciated my sentiments but remained mostly excited about their climbing (I can understand that). My thoughts that day go back to my early exposure to the mountains when, as a 14-year old, I was given the opportunity to have three solo days in the midst of a 20-day backpacking trip, giving me the time to observe the stars and the flickering light on the boulders from the campfire. My interpretation of the experience at the Cookie has a very long history, and one that probably goes back to the very fabric of being human. Being in Yosemite as a climber and year-long resident for most of the past 36 years has inspired me to try to understand what it means to be human, and what it means to relate to the privilege of being in this beautiful place. I am still moved, even after all these years, with this sense of wonder. In reflecting on how far we have come since Kenji and my conversation with Ron at Inspiration Point in November of 2008, I am gratified for the generous support of so many – individuals, foundations, corporations — in helping Ron to realize his vision of education nature’s way. Thanks to your support, we have matured as an organization, and have been able to share the wonders and healing power of Yosemite with young people through day trips and camping trips. We have built ongoing relationships with many of these young people through our ability to bring them on multiple trips, and they continue to keep in touch with Ron. Please check out our annual report on our web site if you haven’t had a chance to read it yet!